We are grateful to the Pleasant Hill, Iowa Police Department for their support and participation in this seminar. As a matter of fact, it was PHPD that took the initiative to invite us! Chief Al Pizzano extends an invitation to all Iowans to attend the seminar. Monday's seminar will help equip churches to be prepared for acts of violence. Colonel Grossman will speak on Tuesday. Pastors, church safety teams, ushers, youth workers; all are encouraged to come. The price covers both days. OFFICER GREG STEVENS (right photo) IS COMING WITH US - - In May of 2015, Officer Stevens took on two terrorists that had driven from Arizona to Texas - with intentions of committing mass murder at a convention center. Officer Stevens shot both of them, saving countless lives. For his heroics, he was awarded the Medal of Valor by President Obama for "preventing a deadly act of terrorism." Watch the video of Officer Stevens receiving the Medal of Valor. TUESDAY 8:30 A.M. - 3:30 P.M. 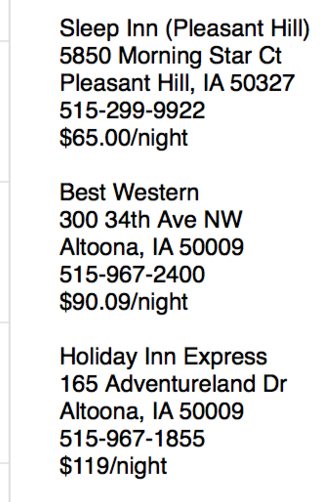 These are hotels that have offered special rates for attendees of the Sheepdog Seminar. Call them at the listed number and book your room(s).